This summer I plan to tackle four decorating projects that are in varying stages of progress: the playroom, master bedroom, craft room, and the breakfast room. With our new au pair arriving this Friday, (our current au pair has been with us for a year and is moving on to bigger and better things *tear*) I decided that this past weekend would be the prefect time to finally, really decorate the playroom. 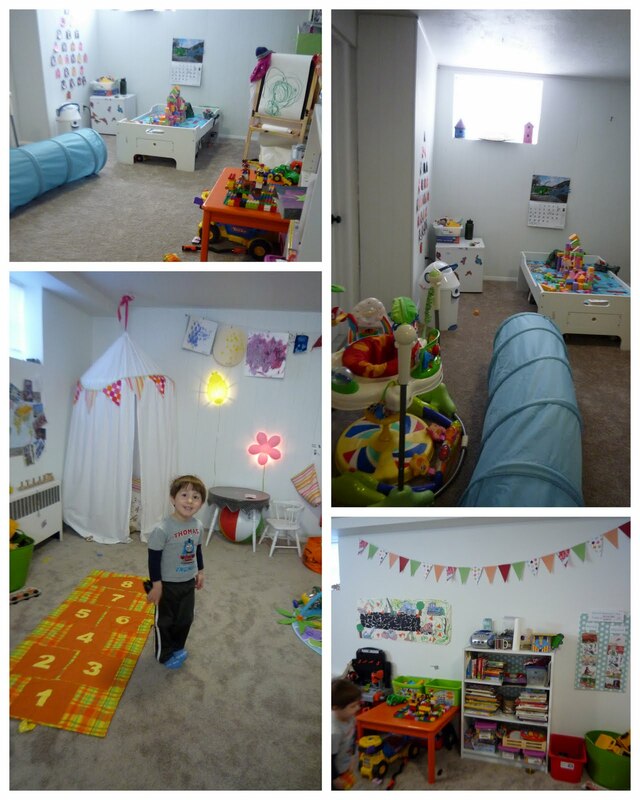 When we remodeled the basement last year the only upgrade we made to the playroom - an already finished space - was to replace the carpet. Eventually we would like to replace the paneling and fix some of the remodeling shortcuts made by the previous owners, but those things aren't likely to happen any time soon. I started working on the playroom last summer when I made a play tent (details here) and fixed up an old Ikea bookcase (details here). Then I basically ran out of steam. As you can see in the following before shots, the room was fine the way we had it, but it also felt a bit like a catch-all for toys and not really the bright, fun, cohesive space that I knew it could be. The room is long and narrow and I have arranged and rearranged the furniture numerous times. When we have guests the room has to serve double duty as a guest room so there has to be enough space to put a queen size air mattress. I spent a lot of time thinking about the layout and I am finally happy with it. Normally I select fabric first, then the paint color, but this time I chose the paint first. I thought painting the whole room would be a bit much and would only highlight the imperfections from the poor paneling installation, so I painted the only wall without paneling light blue (Behr - Sapphireberry). In the middle of the blue wall I painted a big orange (Behr - Orange Zest) square. I applied two coats of a magnetized primer before applying the orange paint. I also nailed Ikea cork trivets (painted orange) to the square for additional art hanging surfaces. I was very lucky to find the perfect fabric at Ikea. It doesn't feel too boy or girl and it really ties all of the colors together. Because the kids spend a lot of time in the playroom, I wanted to make it a place that emphasized learning and playing. To help the au pair keep the kids on some sort of routine, I created a daily schedule (1). In addition to a spot to hang a calendar it has a place to write the day of the week and then select daily activities such as school, story time, play date, playground etc. I made the activity cards (2) by copying pics of kids books (via Google images) printing them on card stock, cutting them out, and laminating them. They stick to the board with Velcro. The schedule is hung at kid height so that they can help the au pair plan their day. Next to the orange display wall is a chair for story time (3). The chair was in Elliot's nursery, but doesn't match his big boy room. It felt like an after thought in the room before, but now matches the blue wall perfectly. There are also lots of floor pillows and cozy places to curl up and read books throughout the room. Elliot's favorite place to read is the tent. Speaking of reading, have you ever seen fabric book shelves (4). I have (although I can't remember where) and I have been wanting to make them ever since I first spotted them. They were super easy to make and they add a nice pop of color to the wall. To help teach Elliot about different countries and cultures I created a postcard map (5). I mounted a world map on foam board and hung it on the wall with command strips. Tacks and yarn link post cards to their origins. Friends and family have been great about sending post cards. My mom went a little nuts in Australia and New Zealand and sent 9! Elliot loves to get mail and each post card teaches him something new. Lastly, I wanted to share a few of the little design details that I thought fit the form and function of the space. Have you decorated a play space in your house? I'd love to see it. Join the Facebook page and share your creative play, or other, space. Got a question about this space? With so much to share I am sure I missed some sources and other details. 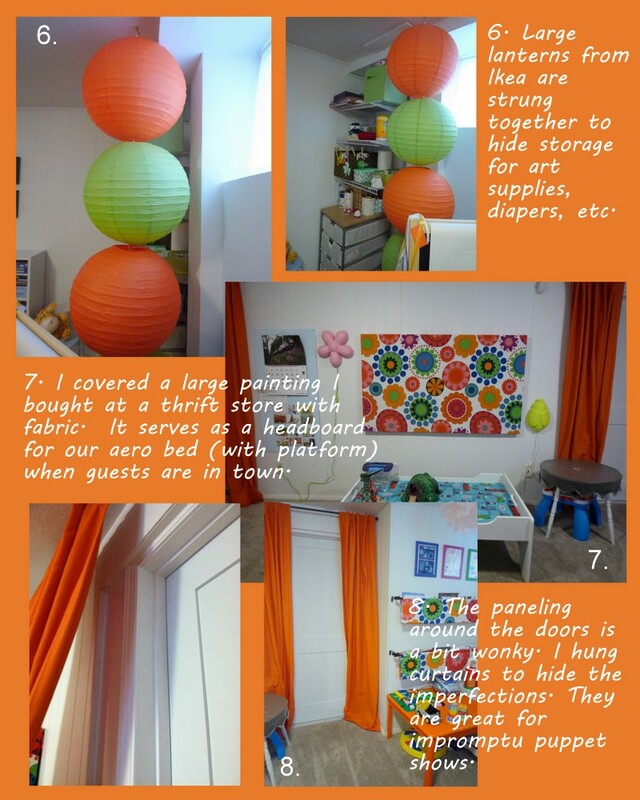 This totally inspired me to do more with our playroom. I googled "kid's maps" or something and found all this beautiful learning wall art by Eeboo. (I'd never heard of that company before.) Love the postcards. I might have to get my international friends on that! Kelly, I am glad this post inspired you! I can't wait to see what you come up with. Thanks for letting me know about Eeboo - their stuff is really cute.